Water Front Delicacy! With membership to the Winter Cove Yacht Club and a sheltered cove, this property will appeal to the boating enthusiast. Watch eagles glide before you at eye level and seals and killer whales against a beautiful back drop of crystal blue water below you. Come see a piece of Saturna Heaven! This cosy little1,004 sq ft two bedroom home looks out to a meadow and to one of our grand mountains, Mount Elford. This is a very private property that is a short walk to the ferry and amenities and is on the community water system. 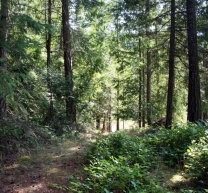 Enjoy this 1/2 acre forested lot situated above Lyall Harbour with a roughed in driveway and fronting onto East Point Road. Is Gulf Island Ocean Front too expensive for your budget? Well how about owning half of a large pond to view from your dream home deck? This is an estate sized property (9.56 acres) with lots of sun, plenty of water, easy hydro access and zoned to allow for a house over 1000 sq ft plus a cottage under 1000 sq.ft. With half ownership of a pond this is an excellent place to build your own little lakeside retreat!